One of my all-time favorite appetizers has always been loaded potato skins. I still get cravings for that combination of cheese, sour cream and bacon. If you want to adhere to the vegetarian lifestyle while remaining keto, the solution is all in the seasoning! I love using chopped mushrooms in place of bacon bits. As you know, we eat with our eyes so appearance is everything. When seasoned and cooked properly mushrooms can fool, or at least entice, most of my carnivorous friends. Smoked paprika is a great tool in vegetarian cooking because it adds depth with a beautiful smoky aroma and flavor. These seasoned little bits of mushroom melt into the layers of shredded cheddar and pepper jack just like bacon would! Add a little salt, sour cream, and chives to garnish and your meat eating friends won’t be complaining! As for the skins, I opted to use a variety of squash called “Mexican Squash” because it is stout, round, and looks more like the traditional potato skin shape. One entire squash is about the size of a large potato and it holds up to the baking process without getting limp or mushy! These are readily available in most grocery stores but if you can’t find Mexican squash, typical zucchini will work, too. 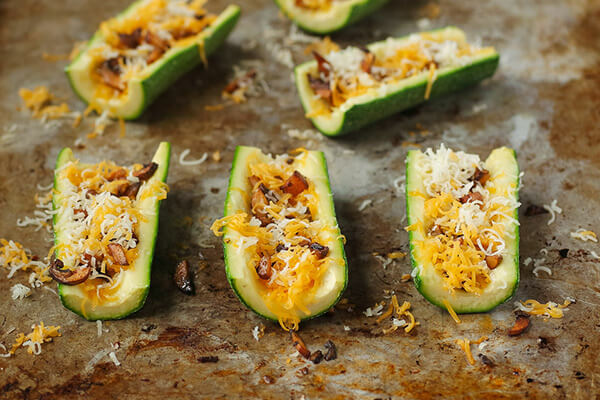 These loaded zucchini skins are great as appetizers or as part of a simple keto dinner. I found that they even reheat well the next day! *The nutrition information for the squash has been altered for 1.5 oz of squash, per half, after the seeds have been removed. Cremini mushrooms are another name for “baby” Portobello mushrooms. **Make sure you use a brand that does not use anchovies, like one made by Annie’s. 1. Heat oven to 375°F. Prepare the squash by washing well, removing the ends and slicing into halves. 2. 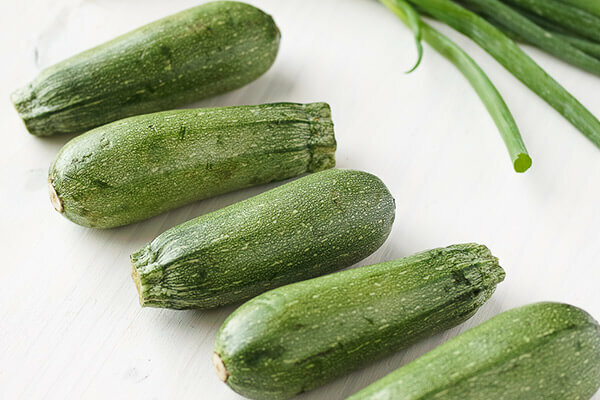 Using a spoon, carefully scrape the seeds from each zucchini halve and discard. 3. 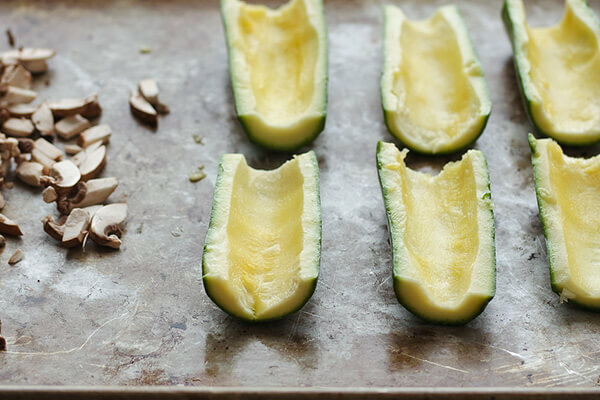 Sprinkle the zucchini skins with salt and let sit to draw out some of the water. Pat dry. 4. Drizzle the diced mushrooms with oil, smoked paprika, ½ tsp salt, and Worcestershire and toss to coat. 5. 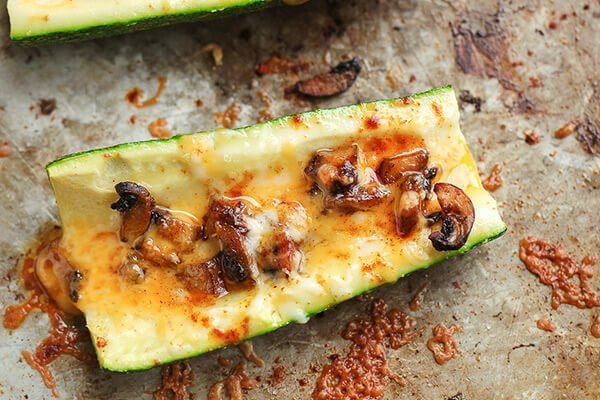 Arrange the zucchini and mushrooms on a baking sheet and roast for 8-10 minutes or until the mushrooms begin to brown and sizzle. 6. 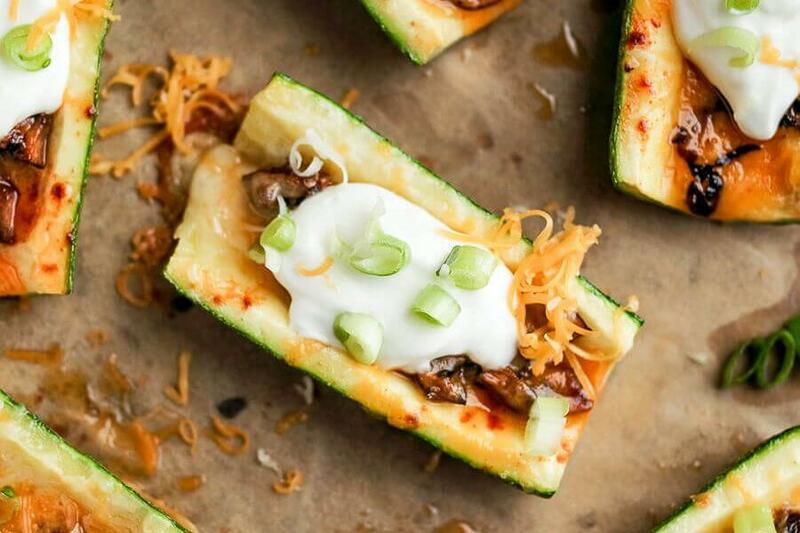 Remove the zucchini from the oven and top with the roasted mushrooms and shredded pepper jack and cheddar cheese. 7. Bake for 5-10 minutes or until the cheese is melted and bubbling. 8. Top with sour cream and chives. 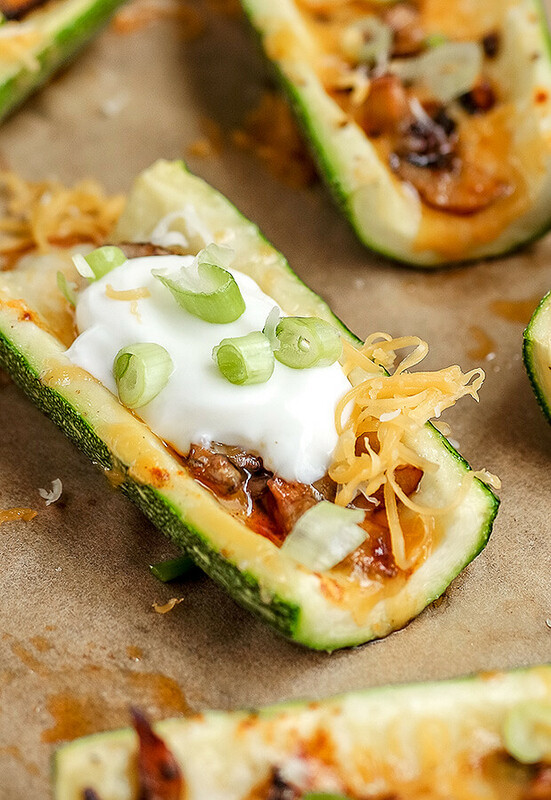 This makes a total of 6 servings of Vegetarian Loaded Zucchini Skins. Each serving comes out to be 108.5 Calories, 8.25g Fat, 2.82g Net Carbs, and 5.76g Protein. **Make sure you use a brand that does not use anchovies, like one made by Annie's. Heat oven to 375°F. Prepare the squash by washing well, removing the ends and slicing into halves. 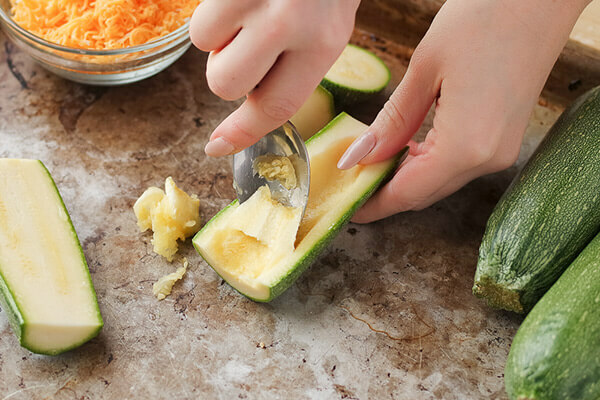 Using a spoon, carefully scrape the seeds from each zucchini halve and discard. 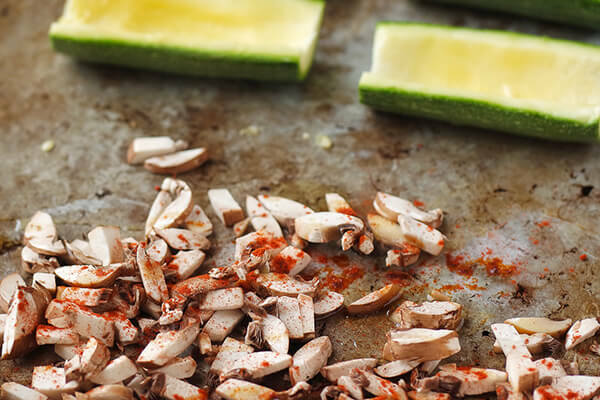 Sprinkle the zucchini skins with salt and let sit to draw out some of the water. Pat dry. Drizzle the diced mushrooms with oil, smoked paprika, ½ tsp salt, and Worcestershire and toss to coat. 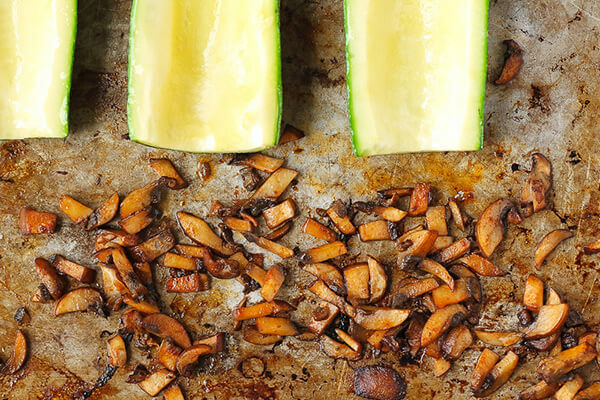 Arrange the zucchini and mushrooms on a baking sheet and roast for 8-10 minutes or until the mushrooms begin to brown and sizzle. 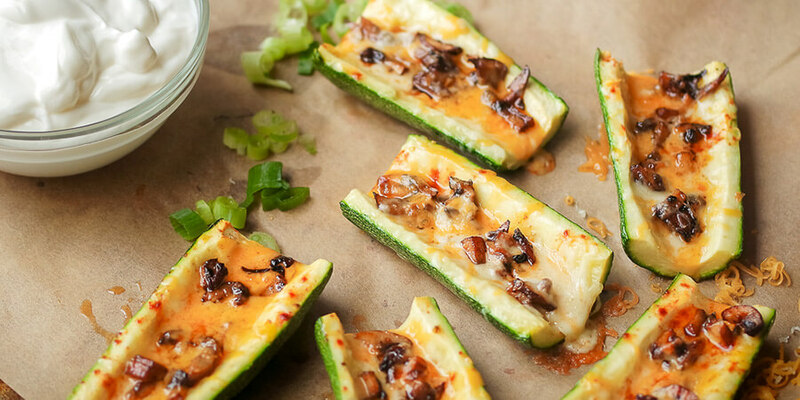 Remove the zucchini from the oven and top with the roasted mushrooms and shredded pepper jack and cheddar cheese. Bake for 5-10 minutes or until the cheese is melted and bubbling. Top with sour cream and chives.